Going to university was always an ambition for Oluwatosin, but having had to take care of herself since the age of 15 meant Oluwatosin had to overcome challenges most people never have to face: "I started taking care of myself from the age of 15 with my sister who was only a year older than me", Oluwatosin says. "It was just the two of us acting as our own mother and father, having to learn how to survive and do things that we shouldn't have been worrying about at our age. There was pressure to put food on the table and to pay all sorts of bills. Juggling work, college and personal family affairs put a lot of strain on my studies and I started to see my dream of going to university slip away", she adds. "But I reached a point where I wanted a change in my life and I kept telling myself that no matter what, I will get there and one thing I learnt was that a dream doesn't become reality through magic - it takes desire, determination and hard work." 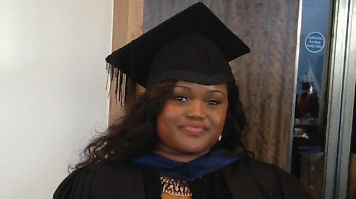 Having overcome the challenges of making it to university in the first place, Oluwatosin delivered an outstanding performance on her course, earning her a sought-after first class degree: "I enjoyed every moment of being a student here both socially and intellectually", Oluwatosin reflects on her time at LSBU. "I felt a sense of belonging, the students were friendly and lecturers were great. I have left feeling happy that I have accomplished what I came to do and have met some great and wonderful people, but I am also sad that it is all over." Oluwatosin is now putting the same determination into her professional career, having worked as a Finance Assistant since 2012, which has given her invaluable work experience. Not resting on her laurels, Oluwatosin is currently also working towards becoming a qualified accountant with the Association of Certified Chartered Accountants (ACCA), after which she wants to progress into Postgraduate study. Oluwatosin was awarded her first class honours degree in BA (Hons) Accounting and Finance at LSBU's Faculty of Business graduation ceremony on Monday 21 October. The ceremony took place in the heritage-listed Royal Festival Hall, one of the world's elite event venues, situated in the Southbank Centre near LSBU's London campus.